Prior to 1834, a Saffron Walden parish workhouse operated at the top of the town's High Street, in the vicinity of the White Hart inn — perhaps where numbers 88-90 now stand. 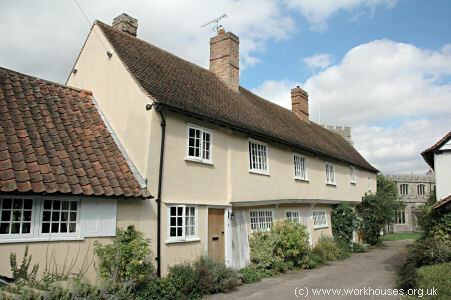 The purchase of an adjacent cottage in 1798 allowed the workhouse to be extended and a bridewell, or gaol, incorporated. There was also also a manually operated corn-grinding mill on the site. The building severely was damaged by a fire in December 1835. Ashdon's old guildhall, which was erected in around 1500, became the parish workhouse in 1775. John Atherton was appointed as the first master and there were 25 inmates. A Parliamentary report of 1777 recorded that the Ashdon workhouse could accommodate up to 30. The inmates were employed in spinning yarn. Ashdon's former parish workhouse, 2006. Clavering, too, redeployed its old guildhall as a workhouse in 1760. In 1782, Clavering was paying for at least some of its paupers to be sent to the workhouse at Thaxted, indicating that it was either full, or had ceased operation. The workhouse was, however, operating in 1835 — a record of goods delivered there in that year included flour at 26s. per sack, pork, country cheese, good dutch cheese, yellow soap, and candles. 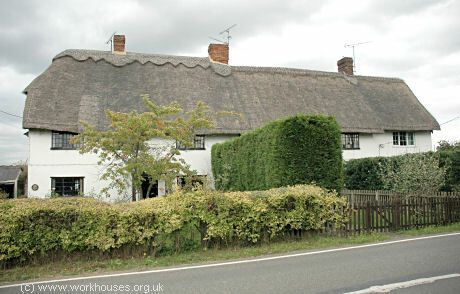 Clavering's former parish workhouse, 2006. An early workhouse was erected at Newport in 1709, possibly at the south side of the junction of the High Street and Wicken Road. The inmates were employed in spinning, with any income generated going towards the inmates' maintenance. A new workhouse was erected in 1799 at Bury Water Green (now 1-2 Bury Water Lane). The building, 63 feet by 16 feet, plus an outbuilding 7 feet by 12 feet, was financed by local Lord of the Manor, the Honourable Percy Charles Wyndham to provide a "common working room for the poor of Newport". Newport's Bury Water Lane workhouse, 2006. 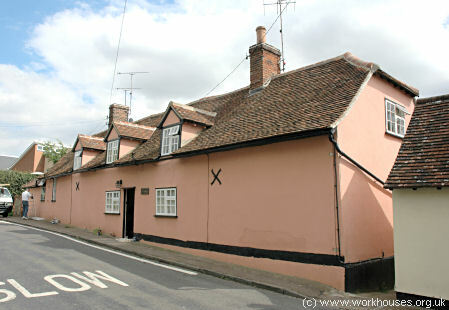 Debden's parish workhouse, now known as Wash Cottages, was situated at the east side of Thaxted Road. 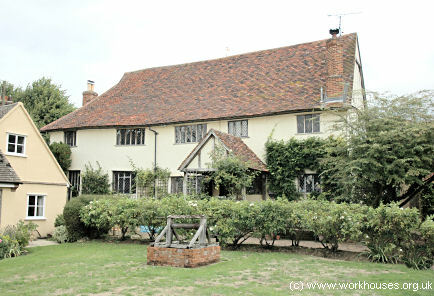 Debden's former parish workhouse, 2006. Essex: Arkesden, Ashdon, Chrishall, Clavering (2), Debden (2), Elmdon, Great Chesterford, Great Sampford, Hempstead, Langley, Little Chesterford, Little Sampford, Littlebury, Newport (2), Quendon, Radwinter, Rickling, Saffron Walden (4), Strethall, Wendon Ambo, Wendon Lofts, Wicken Bonhunt, Widdington, Wimbish (2). The population falling within the union at the 1831 census had been 17,987 with parishes ranging in size from Strethall (population 41) to Saffron Walden itself (4,762). The average annual poor-rate expenditure for the period 1833-35 had been £16,373 or 18s.2d. per head of the population. The new Saffron Walden Board of Guardians met for the first time on the 13th April, 1835, at the Rose and Crown public house. They resolved that a new workhouse building was needed and set about finding a suitable location. They originally planned to buy a three-acre site in White Street Field. However, this proved to be unsuitable for the workhouse, and the Guardians' Chairman Lord Braybrooke purchased some land on the north side of Seward's End Road (later Radwinter Road) which he then leased to the Union. The new workhouse, to accommodate 340 inmates, was built in 1835-6 to a design by James Clephan of Silso who was also the architect of the workhouses at Ampthill and Wellingborough. The construction was carried out by Messrs Bennett and Barber of Cambridge. total cost of the land and building works was £7,333. A further £1200 was required in 1841-2 for additional expenses incurred in completing the building. The workhouse layout was broadly based on the popular cruciform plan and constructed from white stock brick. The main ranges were of three storeys, with single-storey ranges enclosing the inmates' yards. Its location and layout can be seen on the 1919 map below. Saffron Walden workhouse site, 1919. An entrance block faced the road to the south. Above the entrance was the workhouse clock whose original mechanism still survives. Saffron Walden from the south, 2001. To the rear, the accommodation wings for the different classes of inmate radiated from the octagonal supervisory hub where the Master and Matron's quarters were located. Men were accommodated in the west wing, women in the east, boys in the north, and girls in the south. The boys' and girls' wings each included school rooms on the ground floor. The square end blocks of each wing included the board-room at the west, a bakery at the north, and a sick-rooms at the east. Saffron Walden accommodation wings from north-west, 2001. In 1846, the Guardians decided to build an infirmary, washhouse and laundry in the north-east yard. Four fever wards were erected in October 1848. By this time the workhouse could accommodate a total of 400. To the south-west of the workhouse was the casuals' block with a row of cells along each side, lit only by tiny round windows. Saffron Walden casuals' block from the south, 2001. The workhouse later became St James' Hospital, and later Saffron Walden Community Hospital. A new hospital has now been built on an adjacent site and the workhouse converted to residential accommodation. Essex Record Office, Wharf Road Chelmsford CM2 6YT. Holdings include: Guardians' minutes (1835-1930); Admissions and discharges (1916-32); Births (1836-1913); Deaths (1866-1914); Creed registers (1891-1938); etc. Cooper, Jacqueline (2000) The Well-ordered Town: a story of Saffron Walden 1792-1862 .